Toronto, Canada – September 30, 2005 - Pixela Corporation, a leading manufacturer of PC peripheral hardware and multimedia software, today announced the worldwide availability of DV to USB 2.0 Transfer Cable, a unique cable that transfers video and still data from a digital camera to a PC without a "firewire" connection. The DV to USB 2.0 Transfer Cable, available in PAL and NTSC versions, is designed to provide superior image quality and transfer times. One side of the cable is equipped with a firewire IEEE 1394 4-pin plug which connects to a video camera and the other side is equipped with a USB 2.0 plug which connects to a PC. The cable is bundled with ImageMixerTM 2.0, the latest version of the ImageMixer image editing software series. It is able to edit still and movie images and create DVD recordings of pictures and movies captured by digital still cameras and camcorders. The cable package is available for US$90.00. The product can be purchased in Pixela’s e-store at www.pixela-1.com. For more information, visit www.pixela-1.com/capycable.htm. (Note: The cable can be used for Windows® PCs only.) Pixela is actively looking for resellers. 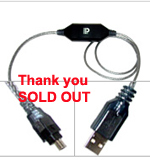 For reseller registration, please visit www.pixela-1.com/capycable.htm. Founded in 1982, Pixela Corporation is a leading manufacturer of PC peripheral hardware and developer of software solutions – from driver development to complete multimedia applications – for digital cameras, color printers and other input peripherals. Pixela's products are sold worldwide and support a broad range of hardware input/output devices, and the Windows, Macintosh and Linux platforms. The company has established strong OEM relationships with Canon, Sony, Matsushita Electric, JVC, Hitachi, Fuji-Xerox, Fujitsu, Kyocera, Fuji Film, and Sharp. Pixela has offices in Osaka and Tokyo, Japan, and in Shanghai, China. For more information please visit http://www.pixela.co.jp/en/index.html. For sales and media inquiries please contact information@pixelacorp.com. (c) 2005 – TargetCast Inc. All rights reserved. All company and/or product names are trademarks and/or registered trademarks of their respective manufacturers.